Superheroes pass on mantles all the time: Sam Wilson is Captain America. Batman is Jim Gordon; Peter Parker and Miles Morales are both Spider-Man. And yet, Janet Van Dyne has endured for over half a century as the sole incarnation of the Wasp (in the comics, at least)... until now. 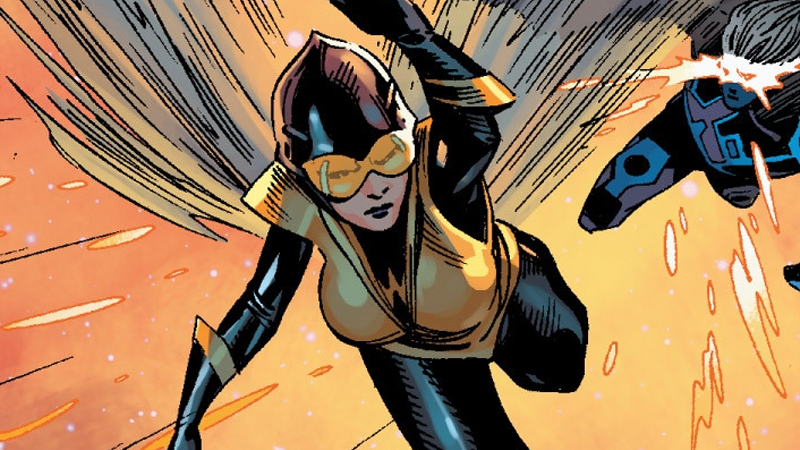 If the yellow and black background wasn’t enough of a hint, today Marvel made it official: Having been absent since the “All-New, All-Different” reboot happened, the Wasp is making a comeback. The twist? For the first time ever, it won’t be Janet Van Dyne. The new Wasp will make their debut in Marvel’s Free Comic Book Day offering, which will also act as a prelude for Civil War II: The Civilening. Although we know it’s not Janet, other details about the new incarnation are sparse, other than that they are suitably shrouded in mystery and will play a role in the current All-New, All-Different Avengers series after an appearance in this Free Comic Book Day special, in a backup story for the main prelude, penned by Mark Waid and with art from Alan Davis. Like I said, superheroes passing on mantles is by no means a new thing. But it seems insane that Janet has managed to avoid that fate for 53 years, only to succumb to it now. Who can possibly replace one of the original Avengers? Will it be some form of Hope, to tie into the Ant-Man and the Wasp movie? We’ll find out on May 7, Free Comic Book Day..